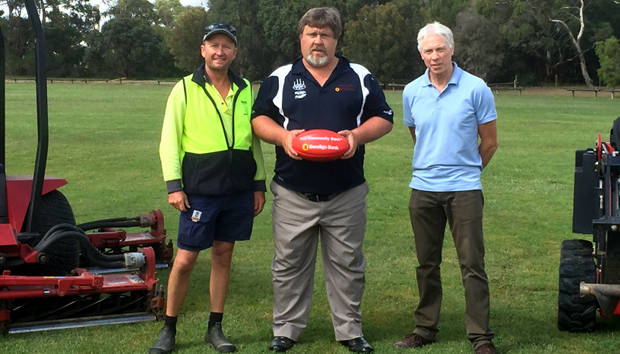 Peter Susovich, the Senior Vice President of The Mornington Peninsula Junior Football League is kicking goals with a brand new football oval for the league. Peter says that the lack of ground space for training and inter-league carnivals prompted him to explore other options, which resulted in him starting from scratch with a brand new space owned by BlueScope in Hastings. “I used to work at BlueScope and this reserve has been here since 1970 and is used once a year for a Christmas party,” says Peter. “Traditionally it was used as local sports facilities in Hastings, it has got squash courts, tennis courts, a model train, motorcycle track and the footy oval where they used to have a footy team. Peter then brought his good friend, Trevor Uren, the superintendent from Devil Bend Golf Club out to the site. It was full of one to two foot high cape weed, so they immediately started an intense weeding program. “I sort of steered Pete to people in the industry that I knew of that would be able to help,” says Trevor. “I came down and dug a few holes and looked at the soil profile and we spoke about how we could clean up the weed infestation which was about 95 per cent. Peter says the biggest challenge for him resurrecting the oval are resources, getting people on board and time, as they want to be able to play football on the surface this year. 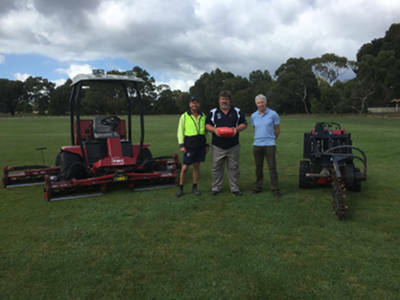 “We reached our tentacles out wide and got people on board like Graham Parmer who he has been instrumental in lining up some sponsorship for us with Toro,” says Peter gratefully. “They have put in around $100,000 worth of equipment. We took the old system out, which was a 1970’s Rainbird System and replaced it with a 90 head sprinkler system from Toro. “Pioneer tanks have also come on board and Grundfos Pumps have donated a $12,000 pump. “Also we have had Anco Turf help out with the turf in the middle of the ground. We demolished a cricket pitch out there and Anco have come on board donating some Santa Ana Couch out there and also around the ground where the holes from the sprinkler system was. “But the main people we need to thank are BlueScope, who have given us a fantastic deal here. The maintenance of the oval will all be done by volunteers. Toro donated a $26,000 4500D Rotary Mower, which will be instrumental in the mowing of the surface. The volunteers will all be inducted and shown how to operate the equipment. Teams like Dandenong Stingrays will be making use of the state-of-the-art facilities, because a large portion of their kids are from down on the Peninsula. The ground dimensions are MCG size, so the under 10 year olds can use it crossways for games and training. “We are keen to have an under 10s carnival out here, especially for the first week of the season, we can get the kids and the parents out here. “We will also do the golf driving range that is onsite, so kids can play footy here while the dads go off over there. “The vision long term is to put the fencing, lighting and electronic scoreboard in and make it a state-of-the-art, junior only, 12 months of the year facility. The reserve itself has got playgrounds, BBQ areas and the aim is to host finals out here the year after this. Peter and the Mornington Peninsula Junior Football League would like to thank all of the sponsors and donors who have helped this project get off the ground.